The Gianni Ferrari GTM is a commercial grass collection ride-on mower that combines high range technical features and specifications, with a maximum width of only 85 cm. 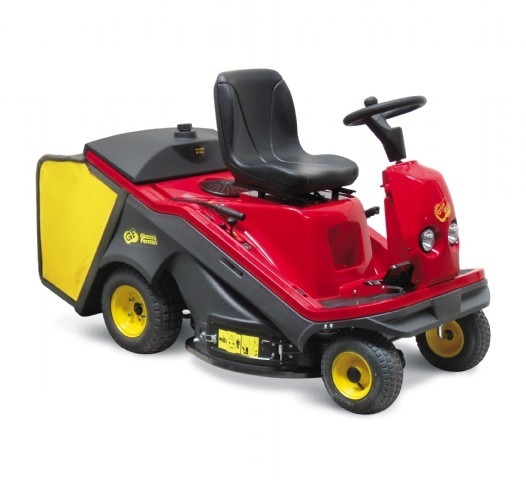 The 80 cm cut, 280 litre grass collection, powerful motors and a reinforced hydrostatic transmission make the GTM a lawnmower with a high production and performance level. The excellent cutting quality and high collection capacity place the GTM in the forefront among small sized professional machines. The 80 cm cut is obtained through a single blade with shockabsorbing floating blades. The PTO is engaged to rotate the blade through a button that activates the electromagnetic clutch, which is reinforced and has life extending system which is adjustable in the event of wear. The deck shell is treated with a special cataphoresis paint treatment that protects it from the corrosion which could occur from the cut grass. Near the grass chute the deck shell is also reinforced with a 5 mm thick steel profile. The deck is equipped with front and rear anti-scalp rollers, adjustable in 2 positions, and is configured for side discharge. The floating blades do not need deck removal for sharpening or replacement, nor does the machine need to be lifted. Therefore, these procedures can be easily performed underany condition and in just a few minutes. The deck cleaning process is facilitated by a quick-release coupling for the water pipe. The external overall size of the wheels, both front and rear, is less than the width of the deck. This means that the wheels do not tread beyond the cutting width, and the grass remains straight when the machine passes on the uncut parallel tracking, resulting in a clean even cut along the entire width. The floating blades are fitted with wings giving an aerodynamic movement of air forcing the cut grass through to the hopper. The direct collecting system of the grass avoids clogging even in tough conditions with tall, moist grass. The direct collecting of grass is a great advantage as far as simplicity of the machine is concerned; noise level and superb collection even with tall, wet grass. The large 280 litre hopper is a mesh bag treated with an anti-UV additive and has a steel tubular frame. A special anticorrosion treatment (cataphoresis) protects the hopper frame from the corrosiveness of cut grass. The audible warning advises the operator to disengage the PTO when the hopper is full, thus preventing the obstruction or clogging of the collection chute. The hopper emptying process is servo-assisted by a gas spring that reduces strain on the operator and is controlled from the driver’s position through the activation of a lever. The bottom of the hopper can be easily removed for rear D discharge. There are 2 petrol engines available. One is a 15.5 HP single cylinder engine, the other a 16 HP V-twin cylinder. Both engines are equipped with an air filter that has a dual filtering element and a pressure lubrication system with oil filter. These features increase the protection and life of the engine. Access to the engine is quick and easy and does not require the use of tools. In just a moment, the filters and oil level can be checked, and the relays, fuses, and battery can be accessed. The large 19 liter fuel tank allows for longer work periods without refueling and is equipped with a level indicating cap. The power transmission to the wheels is obtained through a reinforced type of heavy duty hydrostatic transaxle. A 5 mm thick steel sump guard protects the transaxle from possibly knocking against kerbs, rocks, and roots. A single quick and intuitive pedal controls the forward and reverse directions for maximum simplicity in use, along with an adjustable system with damper and contrast spring that damps the braking in order to guarantee comfort for the operator when changing direction. The construction of the GTM is solid and robust. Its load-bearing frame in tubular steel is treated with a special anti-corrosion treatment (cataphoresis). The front axle is constructed in single block, press-forged steel, and the front wheels turn on maintenance free sealed bearings. All the tighteners and pulleys are metal. Every part of the machine can be immediately accessed, in order to facilitate inspection and maintenance.